Imagine an island right in the middle of the Indian Ocean, with bright white beaches, a lagoon awash in deep blues and aquamarines, and soaring coconut palms swaying in the breeze. 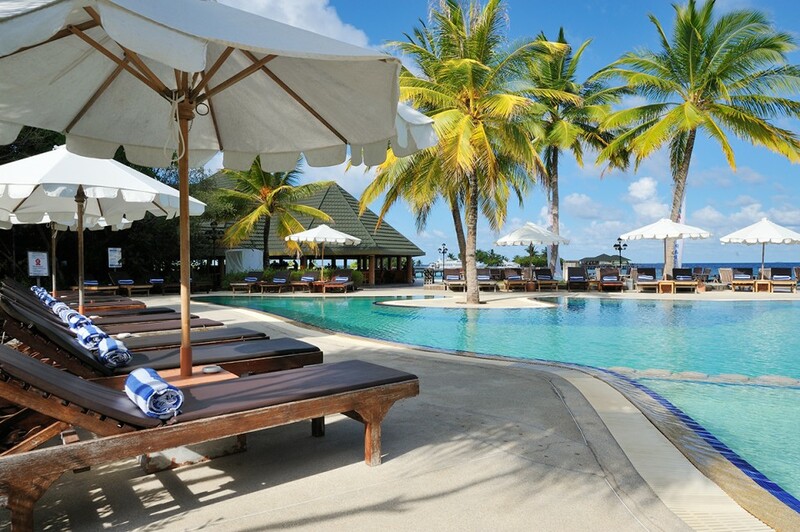 This is paradise – Paradise Island Resort & Spa to be precise, an uncompromising destination of luxury and comfort. 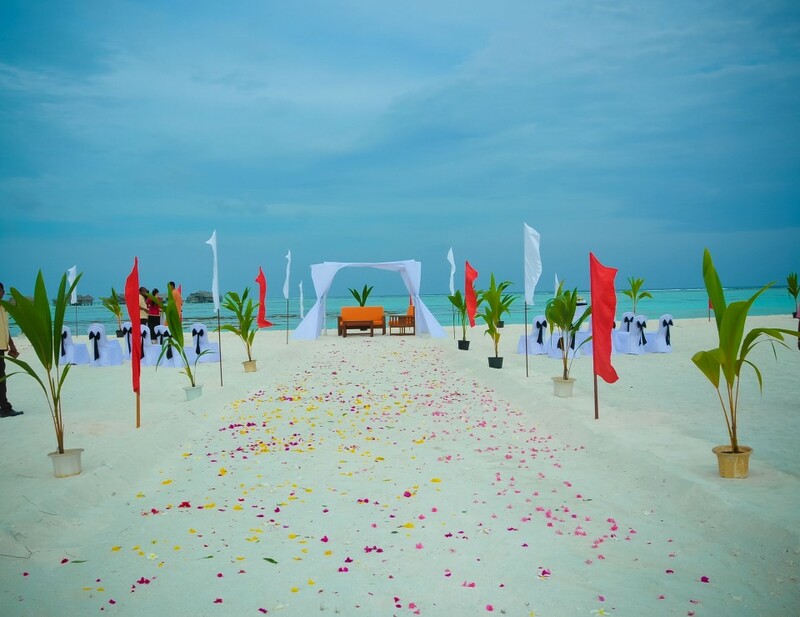 A network of paved pathways winds through the lush grounds, connecting the oceanfront accommodation, gourmet dining spots, sports facilities, and an inspiring spa – each serving to make your Maldives island resort holiday whatever you’d like it to be. Treat yourself to true tropical-inspired luxury at this alluring Maldives island hotel, where unforgettable experiences await. 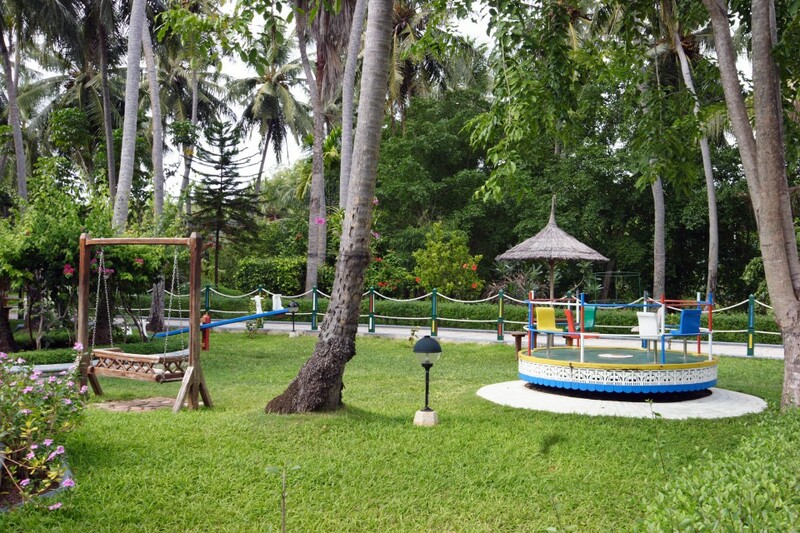 Garden Villas are located in the quiet garden area of the Paradise Island resort & Spa. 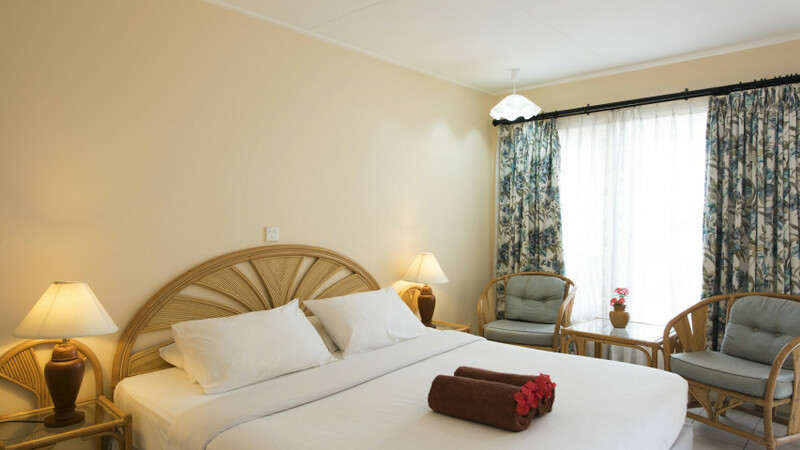 This room offers the basic facilities and a peaceful environment, with the beach easily accessible within a minutes walk. 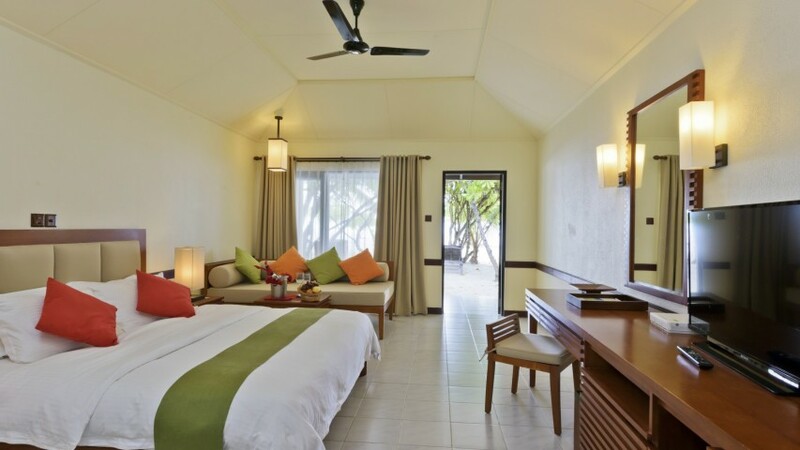 Set just behind the beach treeline, our Maldives beach bungalows provide the ultimate in tropical luxury. While some rooms are detached, others are in blocks of two, perfect for families or groups. White walls and ceilings provide for an airy and light atmosphere. Step through the front door to a tiled veranda facing the beach, furnished with comfy sun loungers – an idyllic place for an afternoon of reading or enjoying the ocean breeze. 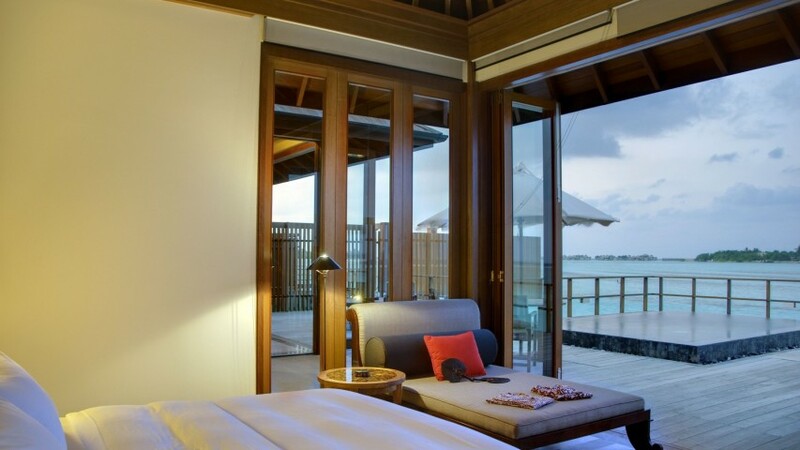 There is no other Maldives beach hotel accommodation quite like it. Paradise Island offers an enclave of secluded Maldives villas that enjoy sweeping ocean views and a host of superb luxuries – ideal for guests seeking a truly captivating Maldivian vacation. Built on stilts directly above the water, within the exclusive Haven complex, each Maldives vacation villa features a separate lobby area and access to a private Jacuzzi. Perched at the edge of the reef, the Ocean Suites at Paradise Island offer a truly incomparable experience. Bask in magnificent views of the breathtaking, crystal clear lagoon and the ocean beyond from the window of your exclusive Maldives suite. Enjoy exclusive use of the private pool. 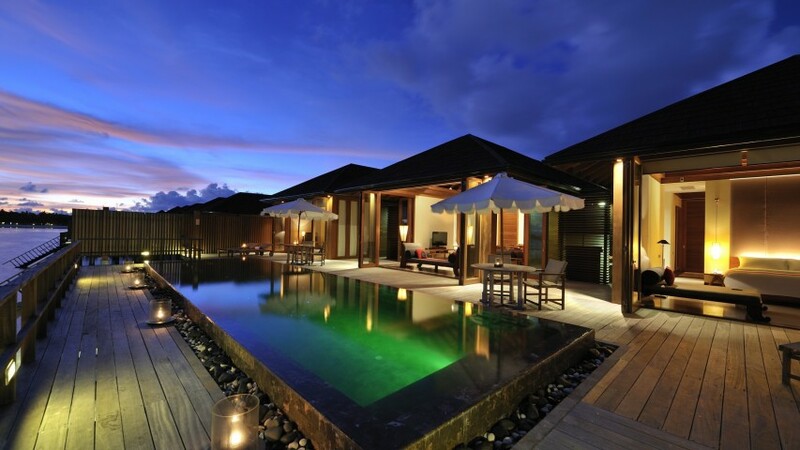 Plan an incredible luxury vacation in these spacious, two-bedroom Maldives beach accommodation. Come discover why the Main Restaurant at Paradise Island Resort & Spa is celebrated among the best Maldives restaurants year after year. Serving sumptuous, buffet-style breakfasts, lunches, and dinners, this breezy Maldives restaurant perfectly captures the island spirit with alluring Indian Ocean views through expansive windows. 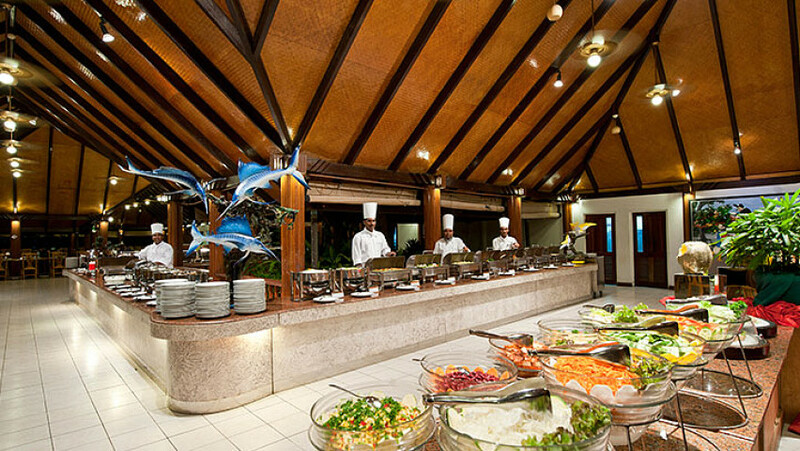 A full continental European or English breakfast is available at the breakfast buffet, and a wide variety of Continental, Asian and Maldivian cuisine is served at lunch and dinner. Wine and dine away the evening, as you delve into tantalizing new tastes at this captivating oceanfront spot. 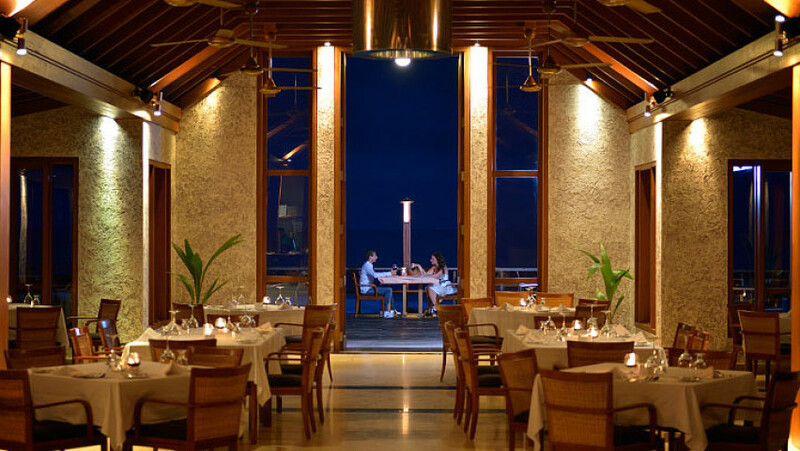 Located at the end of the main jetty, overlooking the ocean, Ristorante al Tramanto offers the perfect Maldives romantic hotel dining experience. Stop by for sunset cocktails or to savour inspired Italian specialties such as fresh baked pizzas and tantalizing pastas. Enjoy the warm candlelit ambiance inside or dine al fresco on the breezy deck. And if you’re feeling tired after a long day in the sun, we’ll arrange to have a pizza delivered right to your room. 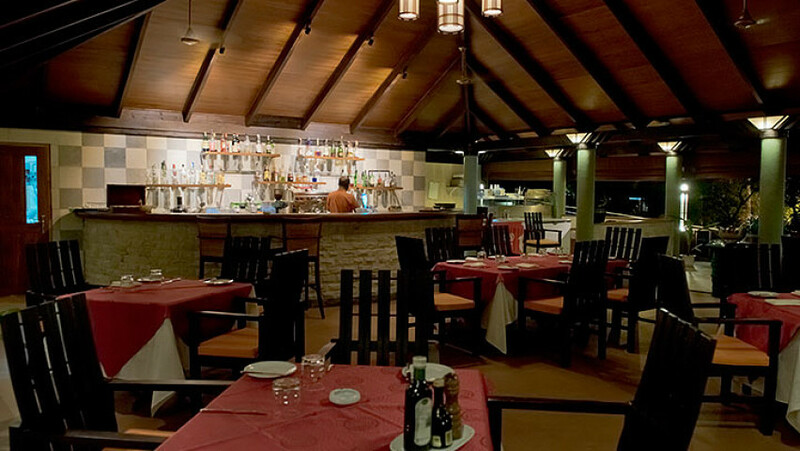 This charming Maldives Italian restaurant is the perfect spot for lively family dinners or an intimate evening for two. A small, decorative bridge over a miniature pool and waterfall leads you to the entrance of this cozy Maldives Japanese restaurant. Adorned in authentic Japanese splendour, the restaurant showcases traditional Japanese teppanyaki, or “show cooking,” in which the chef performs a show as he prepares the meal, showcasing eye-catching tricks and new variations on cooking techniques. Your chef might juggle utensils, flip a shrimp into his shirt pocket or diners’ mouths, toss an egg up in the air and split it with a knife, or arrange onion rings into fire-shooting volcanoes. In additional to the more familiar Maldives sushi dining, a variety of innovative dishes is served. Chefs trained in Japanese cooking use genuine ingredients, imported from Japan. At Fukuya Teppanyaki, the mood is festive and fun, and the meal is always a show in itself. This seafood restaurant built on the edge of the reef faces the sunrise and the breathtaking Indian Ocean. 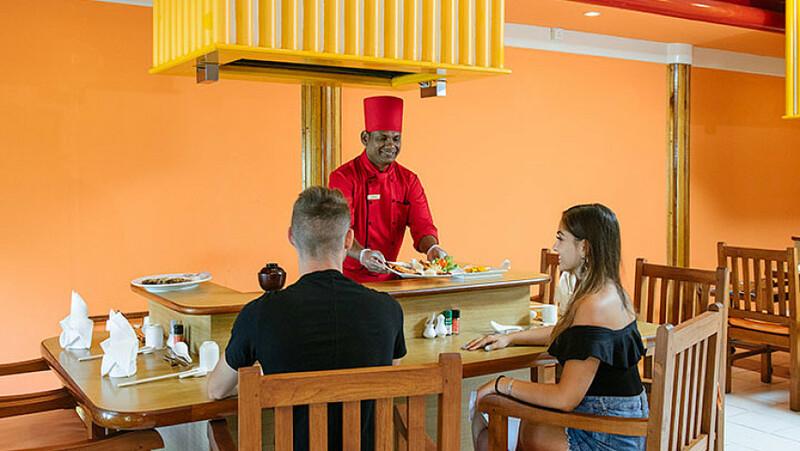 They offer a unique dining experience with an easy-going ocean view ambience, and serve a variety of seafood including the Maldivian lobster. The adjoining large open air terrace offers a relaxing atmosphere where you can meet for drinks, a light meal, afternoon tea or for an after dinner cocktail. 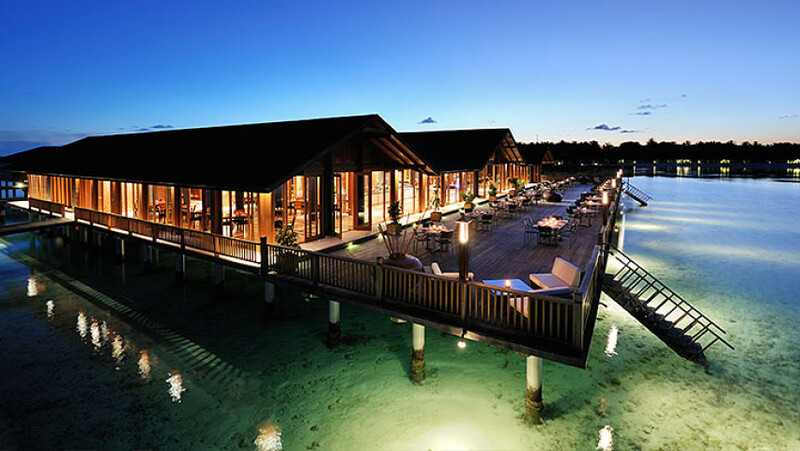 The Lagoon located amidst the water villas with a pleasing view of the blue sea and sky offers a complete cuisine, rich in variety and taste. Enjoy your favorite drink on the spacious sundeck mingled with the cool incoming breezes from the Indian Ocean. A meal here will always be an unforgettable experience. 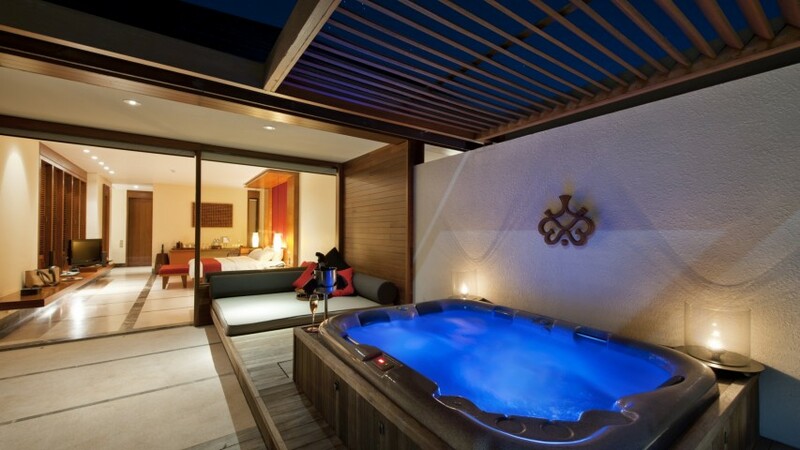 Situated on a quiet corner of Paradise Island Resort & Spa , the Araamu Spa offers a precious retreat within the resort. This tranquil hideaway offers a vibrant reflection of our Maldives spa resort where health, vitality, and radiance are rediscovered. 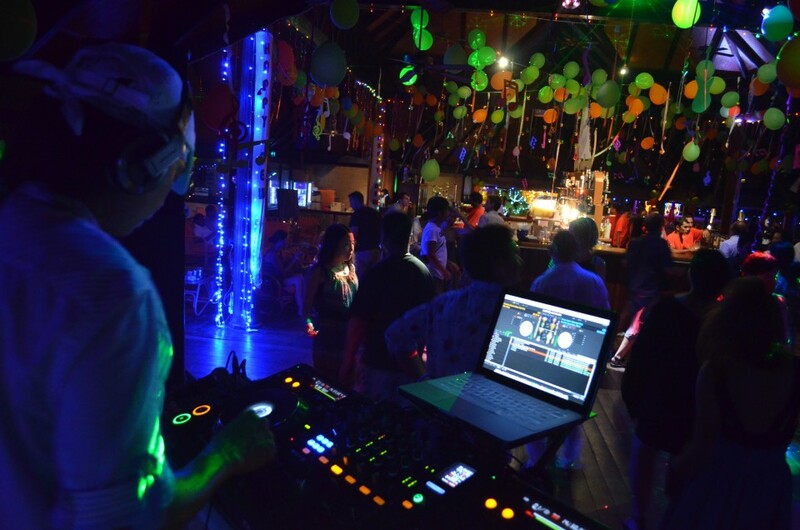 Choose from a diverse menu of services offered in a relaxed ambience designed to stir the soul. Put yourself in the sensitive hands of our experienced Maldives spa therapists and enjoy the sensual pleasure of a great massage. Unwind with a deep tissue Swedish massage. Rejuvenate and replenish with a soothing body treatment or bathing ceremony. Or share the experience with a romantic couples’ treatment in one of our specially designed treatment pavilions.